There are several maps of the Bahamas available here at the Caribbean Amphibian. When looking at maps of Bahamas islands, you must remember that the Bahamas is an archipelago that consists of nearly 700 islands as well as nearly 2500 small islets and cays. However, only about 30 of these islands are inhabited by humans. You will notice in the maps of the Bahamas that these islands begin about 50 miles from the Florida coastline, encompassing nearly 100,000 miles from Palm Beach Florida to within 50 miles of Cuba. The Bahamas are geographically considered part of the Caribbean, though they are primarily in the Atlantic Ocean. The Bahamas became islands as a result of coral reefs which became dry land when sea levels dropped hundreds of centuries ago. The islands are relatively flat with miles of beautiful white and pink sandy beaches. Most of the islands remain at sea level, with the highest elevation in the country is a mere 206 ft in Mount Alvernia on Cat Island. The islands are primarily made of calcium carbonate, which is produced by the organisms of the coral reef. It also contributes to the Bahamas crystal clear waters, among the clearest in the world. The Bahamas have such clear water that the visibility level through the water is amazingly over 200 feet! 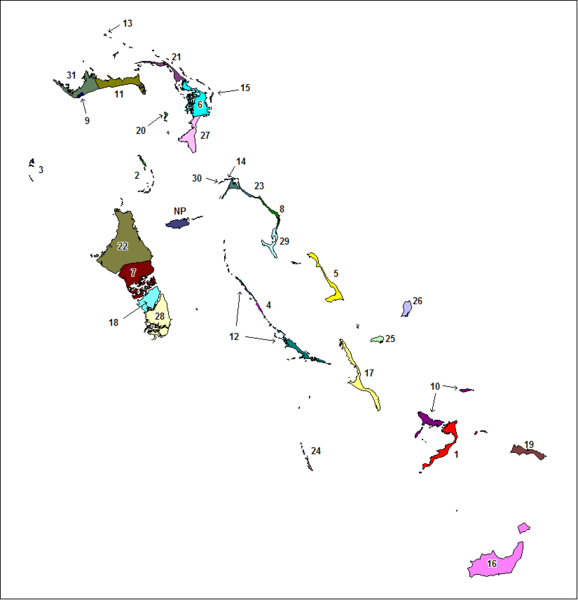 Though it covers a large area, you can see from the maps of the Bahamas that the total land area of the Bahamas archipelago is slightly smaller than the state of Connecticut in the United States.